My friend Mike Pankion came over and we loaded a small trailer and his SUV with the contents and the first load of the cabinets from my shop. I had built these cabinets with french cleats for hanging. Makes them easy to remove and relocate. We managed to to get 11 of the 17 cabinets on the trailer. After we got all the boxes with the cabinet contents unloaded Mike had to leave. Now I’m left with a trailer full of very heavy particle board cabinets that need to get down the steep steps to the basement. What to do? I ignore the problem and proceed to clean the new shop space and assess my options and issues with this new house. One pleasant discovery, the shop space already has wiring for 220 volts. It is not tied into power at the other end but that will be an easy job. It will piggyback off the dryer circuit. I thought I would have to run 220 from the main panel for my machines so this will save me considerable time and money. I may upgrade the circuit panel in the future but for now this will do. The next issue was the dripping faucet. The previous owners took the washing machine and left the water connection dripping on the basement floor because the faucet would not turn completely off. Duh? I had turned the water main off earlier to stem the flow. Now I had to fix it if I ever wanted to wash my hands or flush a toilet. This was an old corroded faucet and I anticipated the worst. Frozen threads and broken stem and probably having to replace the whole thing. Fortunately the stem came out with little difficulty and the old and ruined faucet washer came off easily but the head of the washer retaining screw was completely corroded away and I guessed the nub would not be removable. So I applied a method that I learned at my father’s knee. Some WD-40 and gently tapping on the nub of the screw to break the corrosion and let the oil soak in. Carefully grip the nub of the screw with pliers and out it came. Praise the Lord! New washer and screw is installed from my stash, stem reinstalled and faucet is as good as new with no leak. It’s time to deal with the load of cabinets. My friend Archimedes comes to the rescue. I have used his principals of the lever (Give me a lever long enough and a place to stand and I can move the world.) and inclined plane many many times over the years to make impossible jobs possible and do things solo that normally it would take two or more helpers to do. So I took some plywood I had and laid it down the steps. Carry cabinets to top of plywood and easily slide them down the plywood to the bottom where it is easy and safe to pick them up and carry to the new shop area. I’m tired at the end but did not risk falling on the steep steps carrying heavy awkward cabinets. Now all that I need to do is install french cleats to walls and hang the cabinets. Oh, I have six more cabinets to move too as well as a lot more equipment and benches. All in due time. I’d have pictures of these adventures too but for some reason they won’t upload. Don’t have time to figure that out now. Maybe later. Now Tuesday morning it is raining and predicted to rain all week. Bah! Humbug! I need to be moving stuff and keeping it dry is going to be a big pain in the you know what. I’m off to figure that out. Can’t let a little rain get in the way of progress. Yesterday morning, Sunday, we got the keys to the house. Walked through the emptiness before church. It looks a lot bigger without all the massive furniture the previous owner had stuffed in every corner. Also every flaw and defect shows its ugly head. Now we are debating how much we want to do before we move in. There is really no pressure to make the move since the big house hasn’t sold yet. I just hate the idea of living in two places. It always seems that the tool or thing you need is at the other place 10 miles away. The hardwood floors are not bad but they would look a whole lot better if they were sanded and refinished. Big job but a whole lot easier in an empty house. The paint is not real bad either but there is lots of wear and tear that would look much better with a fresh coat of paint. If we are going to paint we should do that before the floors. Not so much worry about drips that way. Decisions, decisions! I spent several hours Sunday afternoon just cleaning the garage and sorting trash from treasure. They left a lot of stuff that they didn’t need in their new apartment. Mostly yard maintenance related (some of which I’m glad to have) and a fair amount of trash. They left an old working frig that I unplugged and put on Free Cycle this morning. I don’t need that spinning up the electric bill. Actually electric meters don’s spin anymore. Ours is digital with an indecipherable LCD readout. There is an antique treadle sewing machine with a broken cast iron leg and missing woodwork. Hannah’s eyes lit up when she saw it! Not sure it is worth fooling with although it is the type of project I’d like to do if I didn’t have so many other higher priorities right now. They left an old school chair with the built in desk top and the drawer under the seat. That sure brought back memories of primary school in Pennsylvania many years ago when I had a desk just like that. The last significant item is a nice Schwinn bicycle. probably will sell that since we already own two recumbent bikes they we don’t ride much anymore. I’ve decided to move all of my shop stuff to the basement first so I have the tools and equipment I need on site. As soon as my friend clears the sod I’ll be building the shed. I need to evaluate how much I want to and can afford to do before we actually move into the main floor. Hannah will continue packing and work on cleaning the main floor baths and kitchen. So I’m up early this morning. I plan to load the pick-up and a small trailer I borrowed with shop stuff and move it all over there this afternoon. I don’t want to make any trips to the new place without a load of stuff. I have many trips to make just for the shop stuff. I’ll need help when it gets down to the big machines and benches. Enough of this for now. I’ve got work to do. Have you ever tried to Blog? It ain’t easy. I don’t know how people that record every detail of there lives in words and pictures do it. I get so involved in what I’m doing I forget to take pictures and by the end of the day I forget or don’t have the energy to record my day’s activities and bits of wisdom. It probably doesn’t matter because I doubt that what I have to say will generate much interest. I’m not likely to go ‘viral’ anytime soon. Nevertheless a few people have asked about our new housing situation and it seems to me to be easier to record the adventure in one place and refer those that are interested to that place. Get a cup of coffee. This is long winded. You have been warned. My last post regarding where we will be living was on Sept 6. Nearly 2 months ago. A lot has happened since then. Here is a rundown on how we got to this point. Sometime in 2014: JoEllen and Gregg Hothem (daughter & son-in-law) say they are going to sell our mansion out from under us and downsize when the girls are off to College. They want to move to a condo and not have all the issues of home ownership. Since we live in our own lovely, custom built (by me) apartment over their garage we will have to move too unless the new owners want to adopt us. 🙂 JoEllen suggests we get two condos in the same development to stay close together. We look at some condos in N. Kentucky that might work but after some contemplation I conclude that my shop and lifestyle is not really condo compatible. Early 2015 I begin surfing the internet in earnest for a place to live since the Hothems say the house will be on the market in the spring. I have in my youthful mind that I will buy an inexpensive ‘fixer-upper’ that I can make our own just like I’ve done with all our previous houses. By early June while we are on vacation in ND, based on internet photos, I settle on a 19th century 2 story with a large detached garage located in N Kentucky. I’m ready to buy sight unseen but saner minds prevail. Jo & Gregg tour the house and determine that the burned out garage and very steep stairs in the house among other things make it completely unsuitable. Death of a vision! Jo & Gregg decide to hold off selling till the girls return to college in the fall. Our search continues and we look at several more houses in N Kentucky but conclude that what we like and can afford are too far south of the river and our center of activities. During this time we are getting credit checks and finding out how much money we can scare up for down payment and what level of debt we can support. By September 2015 we have narrowed or focus to the area within a few miles our church, wood turning club, and quilt club. We focus on single story with suitable garage and/or basement for a work shop that is in our price range. September 8, 2015 we tour the house we eventually buy. Vision restored! 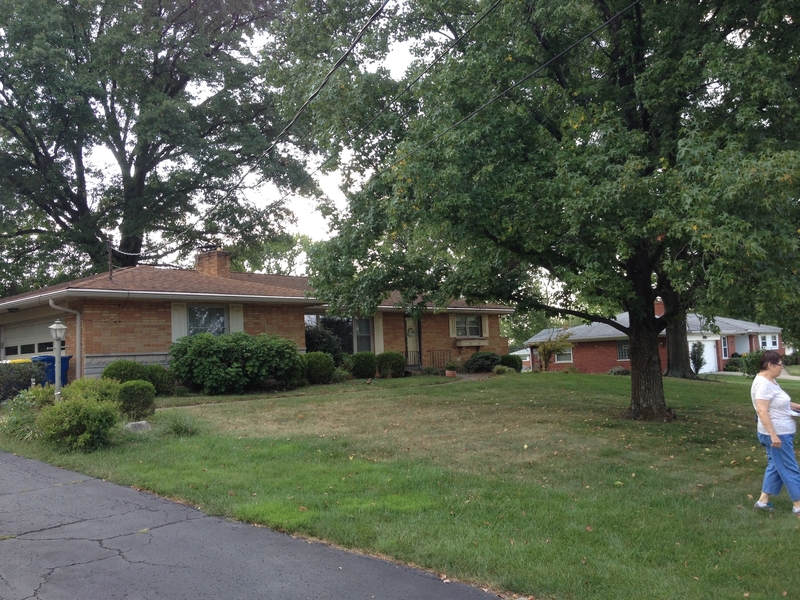 It is a 1959, 1700 sq ft ranch with a full unfinished basement with walk-out access, in a great neighborhood ten minutes closer to most of our activities. It is totally livable without any major remodeling although we have already created a redesign that will make it more our own. Tiny pink and grey tile bathrooms are not our cup of tea. Also I would prefer a level walkout basement (not fixable). Nevertheless it is livable the way it is. Everyone agrees that it is a good fit for us. And we can upgrade and remodel as time, energy and money permit. Our front yard. Note HUGE Oak tree in back yard. Must be around 100 years old. Another Oak in front yard as well as an unidentified tree in foreground. It has leaves similar to maple but seed pods that are large jaw breaker size with prickly points on them. Anyone know what it is? September 9 we make an offer. September 10 they counter our offer. We counter their counter. September 11 they accept our counter offer and closing is set for October 15 giving them 30 days after closing to move. September 16 we have the house inspected. There are a number of issues that the owner is not willing to fix. We decide that we will accept the issues and deal with them ourselves. They are all relatively minor issues all within my fix-it capabilities. September 29 After much paperwork back and forth the loan is approved. 2.99 percent. WOW! The Lord is good! Just need to wait for closing. October 15 the closing goes without a hitch. I’ve never seen so many pieces of paper to sign. My hand has a cramp before we are done. It all seems so ridiculous all of the disclosures, warnings, declarations, CYA papers from everyone involved. What’s the point? If I didn’t sign I couldn’t buy the house. Why can’t I just sign one paper that says I want this place and I’m willing to pay for it? What are my options if I don’t agree with some of this? None! Sign or walk away. If I had exercised my right to read all of it we would still be there. Don’t we love lawyers and our litigious society. What ever happened to a hand shake and a good faith promise?? The sellers said they would be out two weeks ahead of time by the 24th. Here it is the 24th and they say we can pick up the keys tomorrow. We’ll see. Since closing I’ve been puttering in the back yard getting the lay of the land. My intention is to build a 12′ x 16′ storage shed for some of my junk that doesn’t really belong in the house or garage. I’ve gotten acquainted with some of the neighbors, so far nice people, and with the town building department for the permit. I hired a tree guy to give the giant trees that threaten the house a hair cut. I’ve found 3 of the 5 survey stakes that define the property and inferred where the other two should be (saved $300 on a survey) and I’ve hauled a pile of lumber to the site in preparation for shed building. 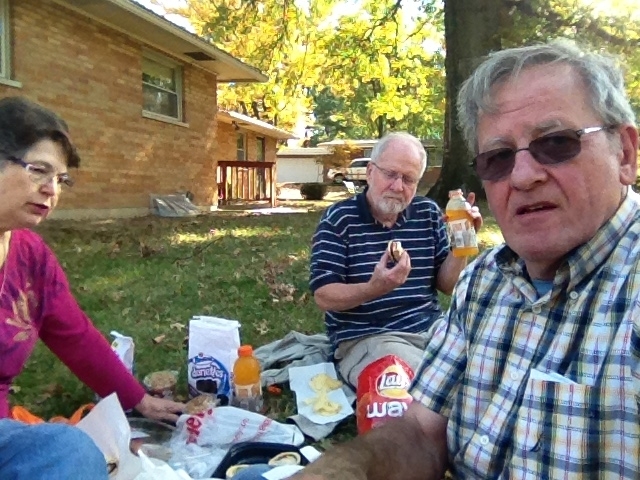 Our first picnic in our new back yard during survey stake hunt. Our friend Mike Pankion brought his metal detector. Unfortunately there was not metal to detect on two corners. I hope there will be many more picnics to come. Note HUGE Oak tree in background. We have plenty of acorns, squirrels and deer as a result. 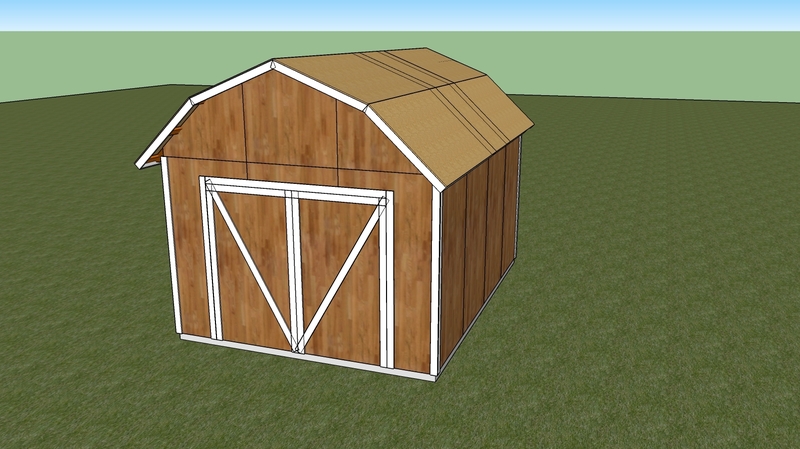 I designed the shed myself using Google Sketch-Up, (a free 3D design program that I just love). I can build it from scratch for half the price of buying an equivalent kit version. While working on the design I researched various floor options. I found it interesting that the price of building the floor using beams, joists, & plywood vs. ready-mix concrete, vs. sand, gravel, cement (rent a mixer, mix your own concrete) are all within 10 percent of each other. Ready-mix wins this one, (less work, better floor). 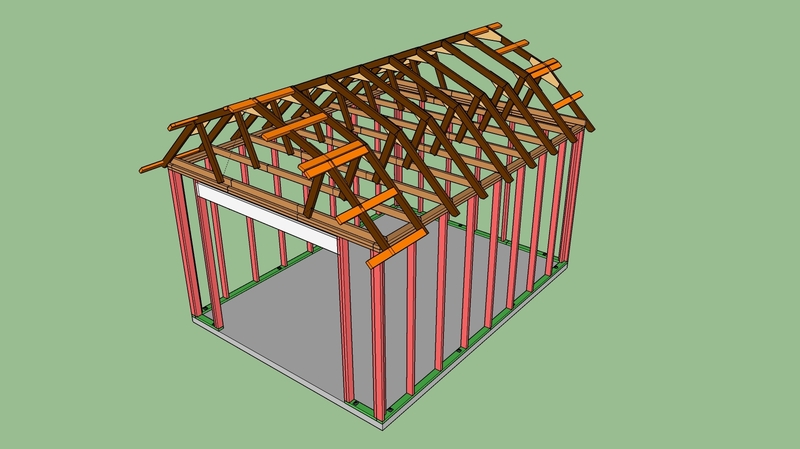 This is my shed design in Sketch-Up. The design was good enough to get a permit. Our apartment is currently about 60 percent in boxes. Mostly dishes clothes and kitchen left. We need to finish packing during the next week. I hope to prevail on my friends to help move the big stuff on Saturday the 31st. I had built some nice built-in bookcases and sewing center for Hannah. I’ve decided to un-build-in these units and move them. It will save me a lot of work on the other end not having to recreate these units. Nevertheless it is a bit of a chore getting them disconnected from their current location without damaging them. My shop is going to be the hardest to move as it consists of some rather large benches and some very heavy machines that will need to be gotten into the basement of the new place. Fortunately there is an outside entrance to the basement albeit with rather steep stairs. A big issue is that there is no 220 volt electric in the area of the basement that I want to put the shop. I will probably get by with a long extension from the clothes dryer till I can do some electrical work. My biggest headache at this time is trying to figure out what to do for TV and Internet service. I’m finding out it ain’t cheap and there are a lot of options. We have been using JoEllen’s cable and Internet up to this point letting her make these decisions. I’m pretty computer savvy but with the many options out there for service providers and black boxes to connect to the service. Non of which are inexpensive, I’m struggling. Without boring you with the details at this point I think I have decided to go with Cincinnati Bell Fioptics Internet plan that includes WIFI. I will buy an HD antenna and my own TiVo DVR. No phone (we’re on Jo’s family plan) or Cable TV. We will see how we do with broadcast TV (16 stations within range), NETFLIX and Amazon streaming TV via the Internet. Probably enough for now as I suspect I’ll not have much TV time till I get the house the way we want it. Although we have been paying Jo & Gregg rent I’m a bit concerned about keeping my cash flow in check. Adding a mortgage, utilities, taxes and Internet/TV monthlies to the list is going to exceed our current rent by quite a bit. Not to mention the inevitable one time expenses of upgrades and remodeling we would like to do. We will see how it goes. So all in all we are very excited and stimulated by this new turn in our lives. I’ve got lots to think about and do that fit my personality and skill set. The Lord has blessed us I believe with a very workable house and it has come together rather quickly and painlessly. I don’t relish the actual move and I have some concerns about finances but I’am excited about the prospects of our new location after we are settled. I haven’t posted here in a while. So I thought this new wrinkle in our life my be worth documenting for those that are really bored and need some senseless drivel to read. A new adventure is beginning in our life. We are looking to buy another home in the very near future. Our daughter & son-in-law JoEllen and Gregg Hothem are selling our lovely abode of the last 10 years and downsizing to a condo. Condos don’t hold two families and guys like me with workshops with lots of tools, some of them quite large. We looked at some in N KY last week and decided we wanted to stay on the north side of the river close to our main activities of church, wood turning club and quilting club. Looked at 3 houses today. One we really like and think it could work for us. Some compromises but very workable. As usual at the very high end of our budget. My mind wants to buy a inexpensive fixer-upper like we always have done but my body and especially my daughter have me pretty convinced that I need to spend more money and not buy so much work. Pray that we will find the right combination of price, features, suitability, location and renovations needed. I guess I got blogged out as I have nothing very dramatic to share. Nevertheless I’m not back to normal yet. It’s been a bit of a yo-yo since getting home. Good day, bad day, so-so day, etc. I’m totally off pain meds and physical healing of surgery I believe is 80-90 percent complete. The issue is my digester hasn’t figured out how to operate without a gall bladder yet. Some days I’m very fatigued and achy flu like symptoms. These are the hardest days. Most every day I feel bloated with a lot of digestive gurgling and churning. Almost always hungry like no matter what I eat it doesn’t satisfy. These days are tolerable but hope they go away soon. My research tells me this is all likely to pass in time as my body adjusts to operation without a gall bladder to store and dispense bile as needed. I may have to adjust my eating habits as I figure out what foods aggravate the system. Generally the need is to cut back on fats. Wednesday was a good day and I was out with my buddies and consumed a Subway sandwich and a small order of fries later in the day. Thursday I paid for it. Friday was better and today is not a bad day at all. Ate very little fat on Thursday, Friday and today to get back on track. So I guess I’m being forced onto a heart healthy diet unless I want to be miserable. Maybe not all bad. I’m at a weight I haven’t seen in a long, long time so there are some good results from all of this. I’ve been intentionally trying to lose some weight since early in the year anyway. This has certainly sped up the process. Now I’m trying to stop the loss. Unfortunately the foods that are digestible are not very calorie dense. Well that’s probably more than you wanted to hear. I’ll stop now. My last entry was Tuesday 10/21/2014. We had made the momentous decision to wait a while longer for the bleed to stop and not institute more invasive procedures. It was the right decision. By 10:00 PM Tuesday my urine was running clear. Needless to say by 6:00 AM Wednesday I’m ready to get out of this torture chamber. I let that be known to the nurse and of course he cannot do anything without orders. Orders only come from doctors who don’t make rounds or do anything before 9:00 AM. Again Shawn does his thing and gets in direct contact with Dr. Braun and gets permission to remove the catheter and begin the discharge process. Removal of the ‘garden hose’ was quick. The most painful part was the 3 inch square sticky patch on my inner thigh. I now have a bald spot in that location. Having this ‘garden hose’ in place for this length of time causes the bladder to forget what it is supposed to do. So the next milestone that has to be passed is that I must urinate on my own before I can go home. That’s great I get a big breakfast with lots of liquids and figure I’ll be out of here before lunch. Wrong again! I do manage to urinate but after urination they want to do an ultrasound on my bladder to check how much I retain vs. what I expelled. Guess what, they can’t get a good reading because the battery is dead on the ultrasound machine. So I agree to a second try a little later. (I contemplate sending out a prayer request for pee.) Bring me more fluids I’m going to get this job done. I drink myself full and the IV keeps running. I manage a second unremarkable pee. The ultrasound works this time but I’m told I can’t leave because I’m still retaining too much. So again they want me to wait in the hospital for my body to relearn how to function. It can do that at home as far as I’m concerned. Nurse Shawn again directly contacts Dr. Braun who OKs my discharge. Nothing happens fast in a hospital. I end up having lunch there and we head home by 1:00 PM Wednesday. Here we are more than 24 hours later on Thursday. I’ve had a great breakfast and lunch at home. I’ve enjoyed my recliner, bed, cat, TV, fellowship with friends and lack of interruptions. Except for a few potty calls I had a good nights sleep in a comfortable bed. As expected my plumbing systems are returning to normal albeit with a bit of reluctance. The “need for potty” warning system is on a very short fuse. Hopefully that will improve. I have not had any pain meds since Monday. I still have a fair amount of abdominal soreness from the surgery and I’m basically just a bit worn down by the whole process. ( I did do one pill at 3:00PM I got tired of being the tough guy.) I have lost 5 pounds since the beginning of this ordeal. Which is OK with me. I’ve been trying to lose weight the past few months anyway. I have every confidence that in a few weeks I’ll be my old self and this life adventure will be all but forgotten except for the bills that already have begun to arrive. A new blog on this will probably follow. There has been a lot of speculation as to why after being 5 days post surgery did I get this sudden bleed. The consensus seems to be that I resumed two of my normal meds two soon after surgery. When they sent me home on Thursday the discharge papers said resume normal meds. I had been taking 81mg aspirin and Saw Palmetto (both of which are blood thinners). So three doses of both of these drugs were apparently enough to break loose the healing scab/clot and start this whole mess. It only took another 3 days for the thinning to wear off and for the wound to heal again. Needless to say I’ll not be restarting either of these for several weeks if not months. The devil is in the details. Why God sent me down this path I’ll probably never know. I do know that I have controlled my overall attitude and frustration through this encounter with the medical community better than I have in past encounters. Either they are getting better with interfacing with me or I’m becoming more tolerant and understanding of the system. Every doctor, nurse, aide or assistant has a different level of expertise, personality, risk tolerance level, willingness to think outside the box, etc. This was greatly illustrated with a couple of the decisions that needed to be made in my treatment. What I know is that in order to get the treatment that you want and deserve you need to take an active part in the decision making process. Ask questions, say no, change doctors, do whatever is needed to be comfortable with what they are doing to you. My cynical side believes that there is a considerable number procedures, tests and protocols that are done just to add to the bottom line of the hospital or doctor’s balance sheet. In addition many of these things are done just to keep the lawyers happy. For instance I asked my kidney doctor if I could get the video CD of my procedure. He was in agreement that that could be done but wasn’t sure that he would be allowed to do it because of liability. I am a strong believer in the rule of law but we are in extreme need of Tort reform in this country! Another small but extremely annoying thing is why does every one that touches you look at your wrist band and ask you your name and DOB every time they come into the room to check your vitals or do something??? I was that person when they put the band on me. Why or how would I change the band. Why would I want to change the band? Makes absolutely no sense to me what the purpose of this inane procedure is. But its got to be done. It’s the rule. How stupid can intelligent people be? This is likely to be my last post on this subject so I just want to give all the praise to God for the marvelous machine he has given us to live in. I also want to praise the skill and patience of each of the Doctors, Nurses, Assistants, etc. etc. that make our modern medical community work. They have a special gene that allows them to minister to old grouches like me and keep smiling. I could not be paid enough to pursue a caregiver profession. It’s not in my genes. When we need them I’m very glad they are there. Nevertheless I know where their skill comes from and my ultimate faith for my well being lies with my creator and God Jesus Christ. Thank you all for being my friends and caring enough to read through all of this blather, pray for me and send your thoughts and good wishes. They do make a difference. Also getting this off my chest helps even if no one reads it. I went home Thursday afternoon in good spirits and apparent good health. I relaxed and recovered all day Friday with normal urinary and bowl functions returning. I eat and enjoy solid food and think I’m moving a little slow but this is not so bad. I’ll be good as new in a week or two. Saturday I go to my woodturning club meeting and bum around with the guys sitting, standing and walking from 9 till 3. I do fine with a pizza lunch and a great vegetable soup dinner at home. All systems seem to be functioning normally. Sunday I go to a woodturning class where 7 of us work one-on-one with the instructor from the Saturday meeting. Another great day of low stress activity, a great Fire House Sub lunch and veg soup for dinner at home. I’m feeling really good and have begun tapering off on the pain meds. Then it happens! I go to the bathroom after dinner and fill the bowl with blood. All prior urinations had been normal. Then the next time I try to go I can’t pee at all. Cold sweat, nausea, Something isn’t right. JoEllen and Hannah call 911 and I take a bumpy ride to the hospital in the EMT van. That was Sunday evening at ~9:00 PM. It is now Tuesday noon and I’m still here. The assumption is that a scab in the kidney incision has come off and entered the bladder and blocked the flow of urine. The first thing they do is insert a Three Way catheter about the size of a fire hose. Not fun but not as bad as I thought it might be. Getting past the prostate was the most ‘interesting’. They hook this up to pairs of 3 liter bags of sterile fluid and stat flushing the bladder of blood and blood clots. I think they have run 5 or 6 bags full through me at this time. Sometime on Monday they turned off the flush and just let the catheter drain on its own and evaluate the amount of blood in the urine. Now the frustrating part. Even though I have a primary kidney doctor (whom I like very much) he is only at this hospital 2 or 3 days a week. As a result other doctors from his Urology Group come through to see me as well as the hospital doctor. They all have a different opinion about what they see coming down the catheter pipe. Is it clearing up? Is it too red? Are there more clots? Should we turn on the flush again. Should the catheter come out? Should the catheter stay in? The bedside manner of this retinue of doctors varies from excellent to less than none. I don’t think these doctors have a clue as to how frustrating this difference of opinion is to a guy like me. I want facts and figures, whys and wherefores, risk vs. benefit. What are my options? Why would I chose one option over another? What is the downside of waiting? etc. etc. etc. The only doctor that is willing to talk to me on those terms is my primary kidney doctor (Dr. Braun) and he’s not here. My blood count dropped overnight so the thinking took a turn to, we need to do an angiogram catheterization to find and plug this leaky vessel. So in prep for that they took me off of solid food again till that decision is made. When I ask about this angiogram procedure they can’t tell me the process or the risks but they think I need it. Not on your life till I know more! My very helpful nurse Shawn takes up my concern and manages to get a call through to Dr. Braun who in detail explains the procedure and the risks. We together decide to wait a while longer to let the body heal itself before starting a new invasive procedure. The issue is that I’m leaking blood from somewhere in the kidney. If it doesn’t stop I will need a blood transfusion. There is some risk in a transfusion but not extreme as far as I know. If I have the angiogram procedure they may or may not correctly identify the leak and plug it. There is a possibility that the plug partially or completely shuts down the kidney. Hey folks loss of this kidney is what we have been trying to avoid from day one. So Dr. Braun and I decide that waiting a while longer with the downside risk of a blood transfusion is not a bad course to take. The upside is that if the bleeding stops on its own we avoid another risky procedure. I’ve got a lot of faith in modern medicine and science. But when things start to get iffy and there is a lot of speculation and little or no concrete evidence then I’m more inclined to rely on my God and the abilities that He has built into this complicated, fragile box we live in. So at this juncture we are waiting another day to see if my old body can’t stop bleeding on its own. If it doesn’t then I guess we go in tomorrow with the zappers to plug the leak. Either way your prayers are appreciated. More to come I’m sure. My last post was Tuesday. Here it is Thursday already and I’m sure most of you have been wondering what’s going on with Kratzer. So here is the story with more detail than anybody needs to know. Wednesday was a day of waiting for that gas to pass, punching the Morphine button and flirting with the nurses. 🙂 Well it didn’t pass on Wednesday so Thursday was more of the same with no substantial nourishment. I graduated from the IV only to a clear broth, jell-0, sherbert, and of course the IV still dumping several liters of fluid into me every day. This fluid wasn’t so bad with the catheter as I didn’t have to think about urinating. The nurse just emptied the jug when needed. After they removed the catheter on Wednesday evening I was getting up to the bathroom every hour to get rid of all the fluids. In one sense the hardest part of this whole process has been the lack of sleep for one reason or another. Vital sign checks, IV equipment acting up, blood draws, housekeeping, potty breaks, walking the halls and a very noisy neighbor that had something a lot worse than mine. By mid morning Thursday I had convinced the powers that be that as much as I like the nurses and all the attention that they were giving me I could do this waiting at home and save myself and Medicare a lot of money. I promised to not eat solid food till the gas had passed and they they started getting the required signatures to make a Thursday departure happen. As it turned out, without warning, I had the long awaited and prayed for passing of gas before they got the papers signed. So we got home around 1:30 in the afternoon. So the most important part that you all have been waiting for. The tumor was benign! It was a golf ball sized oncocytoma. It was completely removed with very little loss of kidney tissue. We are praising the Lord. Your prayers have been effectual and I am very grateful to everyone who has in any way expressed their concern or lifted my name to the great Healer. So I am anticipating a quick and complete recovery from this point on. I have my supply of powerful pain pills that I’m allowed 2 every 4 hours and I haven’t needed more than two ever six hours so far. I’ve got the mandatory follow-up doctors appointments but don’t anticipate any surprises. So a couple weeks of healing and back to my normal activities. I’m actually planning on going to some low stress woodturning meetings on Saturday and Sunday. So I’m having no fluids after 8:00PM tonight and going to bed at my usual 11:00PM with my trusty CPAP machine & I hope I don’t have to move for six to 8 hours. Here it is Tuesday evening 7:00 PM. I woke up about noon yesterday but haven’t been up to computing till now. Seven holes and 3 hours is all it took to remove gall bladder (1 hour) and the growth on my right kidney (2 hours). No biopsy results yet so don’t know for sure if it really is cancer. Will know in a day or two. We learn all sorts of interesting things about our body when we do something like this. First oddity is that the post-op pain is more severe in the shoulders than in the belly. Why do you get sharp pains in the shoulders when nothing was done in that area? Well, they poke the holes then inflate you abdominal cavity like a balloon with air or CO2 or something to give themselves some space to work. It seems that that air migrates up to the shoulder area and causes severe pain until it dissipates. Don’t get me wrong. The belly hurts too but it is a duller constant pain than the sharp shoulder pain that comes in waves. Another thing is that all that mucking around with your guts gets them confused and the rhythmic contractions that usually keep your food moving in the right direction stop working. Guess what. You can’t have anything to eat till they get their rhythm back. So that is why the doc says no food till you pass gas. Gas passing is the indicator that things are moving in the right direction. Apparently there is no way to educate your intestines to move in the right direction. Everyone is different. Walking the halls with your IV pole is supposed to help. So I’m just starting my “laps” and waiting for my digestive track to relearn it’s duties. Mine must be a slow learners because I have had no sign of gas passing yet. Prior to this I’ve always been pretty well known as a gas passer. I don’t know why I can’t seem live up to my reputation now. So, here I sit about to ask my friends to pray that my “gas passer” gets back on the job soon. So I went to bed last night thinking I was coming down with a cold and that the surgery would probably be postponed. My head was stuffed up and getting worse. I want to get this over with and not have to do another round of pre-op appointments. Besides the longer we wait the more chance the tumor has to spread. Not a good idea. Then it occurs to Hannah that it may be allergies. I had done some leaf blowing and rummaging around in the dusty attic. Earlier in the week I had stopped taking all medications (including my daily allergy pill) in prep for the surgery. Nevertheless I decided to take one last night. After an hour or so my head began to drain. Took another pill this morning and head is clearing but I still have a sinus headache but no temperature. Hopefully I’ll be back to normal by Monday morning and surgery time. I’m trusting that a few allergy pills are less detrimental to surgery than an stuffed up head. Surgery is scheduled for 7:30AM Monday. I have no idea how long it will take two surgeons to remove a gall bladder and than a kidney tumor using robots working through multiple holes in my gut. Probably several hours. They tell me lots of little holes are better than one big one. The wonders of modern medicine. We appreciate your continued prayers till we get through this and safely out the other side. We’ll try to keep you posted on progress. I’ll be on my computer as soon as I’m able and they let me. I’ve had a follow-up X-ray and the blasted stone is no where in sight. Strained pee only revealed a few fine grains of sand. Don’t know where the rest of it went but the doc says all is well and we are a go for dual surgery on Oct 13. I had a pre-op appointment with the hospital. WOW! They are serious about no germs in the OR. The night before surgery I have to shower, put clean sheets on the bed and then wipe myself down with giant disinfectant wipes per specific instructions of how many wipes to use on each part of my body. No deodorant, no hand cream, no nothing on my skin but clean sheets and clean clothes before surgery. One more pre-op appointment this week and then all of next week is free to catch up on any physical projects before the big day. Depending on how far they have to open me up I’ll be laid low for from 3 to 12 weeks. Not looking forward to that. The gall bladder guy says he is going first. He will poke a few holes and plug in his robot and remove gall bladder. If for some reason he needs to open me up he will do that to complete the job. No need to wake me and ask. 🙂 Then kidney guy takes over. He says even if gall bladder guy opened me up he will sew me up and poke his own holes and plug in his robot and proceed to remove the growth from my right kidney. Oh, the wonders of modern medicine. I do hope the kidney Doc is right about my 3 centimeter growth NOT being metastatic. I’ve been doing a little research and apparently kidney cancer is very treatable by surgery as long as it hasn’t spread. If it spreads then it is not very responsive to radiation or chemo. We are hoping and praying that this puppy is small and totally confined to the kidney and can be removed and forgotten about. Otherwise the outlook isn’t that great. No cure just some experimental drugs to try. I’m at peace with whatever the Lord has for me but naturally I wouldn’t mind another 20-30 years of being a problem to my kids. More to follow I’m sure. In at 10:00 AM out at 12:30 PM. 3/8 inch stone in left kidney blasted to bits. Now I need to strain pee for a week to catch pieces for analysis. A bit groggy from anesthetic and a little sore on left side. Follow-up X-ray and appointment in one week. If all is as it should be we will proceed with right kidney and gall bladder surgery on Oct 13th. Stay tuned. So I did a little research on what this little adventure might cost. Did you ever try to read a government document? Anyway what I glean from the 300 page tome “Annual Notice of Changes” from AARP Medicare Complete is that my maximum out of pocket expense can’t exceed $6700. That’s encouraging. Not as bad as I thought it might be but of course I may not have read the fine print. So time will tell. If this is true then the Advantage plan is the better choice if you don’t have any major health issues for two years. If a supplement plan cost ~$300 a month, $3600 per year then about 1.8 years is the break even point. I hope this is true. Oh, upon leaving the hospital I quick had an appointment with my PCP as instructed was necessary before the surgery. I did that on the 10th. Well now that the surgery is scheduled for the 13th of October I have to have another ‘do nothing’ appointment with my PCP because to be a ‘valid’ pre op appointment it must fall within 30 days of the surgery. It’s just another $50 copay for nothing but a government paper mill. Another little quirk. The doctor wanted to do a bone scan to check for spread of cancer. The insurance would not pay since I don’t have a history of cancer. I wonder what they think the lemon size thing hanging on my kidney is? Oh, they will pay after it is out and verified to be cancer. So here it is a week & a day since I left the hospital. Exit instructions were explicit about making appointments with my primary care doctor (PCP) and the two surgeons to get all things approve and scheduled. Last Tuesday I saw my PCP and brought him up to speed. A $50 copay to tell him what was going on in my life. He offered a bit of encouragement and gave me a Flu shot while I was there. No tests, no stethoscope, no nothing. He just had to be told what was happening in order to keep all parties happy. No wonder medical costs are out of control. So I get the X-ray this morning and he says the stone has moved and the Lithotripsy may not be necessary before the surgery. My choice. Bah Humbug! I don’t need those kind of choices. Oh by the way I did a little research on the Litho thing and it can damage the kidney and cause kidney failure sometimes. On top of that it is not a inexpensive procedure. I call my insurance company and they say I will be responsible for 20 percent of all Medicare approved charges. No one seems to be able to give me any dollar figure though. I’m on the Medicare Advantage plan which does not require a monthly premium above the normal Medicare premium. Hannah has a supplemental plan that take approx. another $300 per month but in theory covers everything Medicare does not pay. This has been great with her with her heart issues over the years. When we went on Medicare I didn’t think I needed to pay the extra $300 a month since I have been very healthy most of my life. Some quick math. I’ve saved an average of around $250 a month for the last 5 years on Medicare by taking the Advantage plan. So if my total cost of all these doctors, hospital, and drugs exceeds $75,000 I will wipe out all the premium savings for the last 5 years. My experience with Hannah’s medical costs is that I could easily exceed that. Stay tuned. The next question is: “Should I switch plans?” in anticipation of having some other major issue crop up between now and “Death do us part”? Oh by the way we got to decide before mid December because you can only change your plan during the year end window. Don’t we just love government run medicine??? Then I think “Who cares?” I can spend a lot of time writing about my minor medical issue when there are thousands out there, including some very close friends, with issues that make my bit of kidney and gall bladder malfunction look like a hangnail. Then I get an email from a friend with this link: http://www.scifiwright.com/2014/09/your-book-of-gold/ It basically says no matter what you write or how few people read it someone will be blessed. It is more complicated than that though. I think it also applies to art and making things too. I know my wood objects don’t appeal to everyone but eventually there is always someone that expresses a positive reaction to almost everything I make. Different strokes for different folks. It what makes life and people so interesting. For those just joining this blog here is what I have posted elsewhere to bring you up to speed on how this whole thing started. About 3:00pm Sunday Sept 7 at my booth at the Loveland Art Show I began to get a pretty serious bellyache. By the time the show was over and we got home and unloaded I knew I needed some relief. So off to the ER. After a CAT scan and a couple of hours waiting they confirmed a gall stone was the issue and gave me a couple doses of Morphine and the pain was gone. When I woke Monday morning the pain was still gone with no additional narcotic. The other not so good news was that the CAT scan showed a growth on my right kidney. Needed further investigation. So Monday was filled with many trips up and down the halls of B-North Hospital on a gurney for mid section MRI, Ultrasound scan of kidney & gall bladder and chest x-ray to determine extent of issues and a course of action. Bone scan to follow. The gall bladder guy wanted to remove the offending stone that was no longer bothering me on Tuesday knowing the gall bladder will need to be removed later. Two general anesthetic procedures. I didn’t hit it off with him and it looked like a ‘make work’ project to me. I hit it off immediately with the kidney surgeon who is confident that the growth on the kidney is relatively small and treatable by laparoscopy and is not likely to have metastasized. He has vast experience and a very high success rate. We discussed options and decided that the best option would be to do both surgeries laparoscopically at the same time sometime later this month. So our ND trip has been cancelled. We have been assigned a different gall bladder surgeon at my request and I will spend the next couple of weeks seeing doctors, getting tests and setting up a dual surgery for later this month. I have been given a powerful pain killer to avoid another ER trip to use if the gall stone flares up in the next couple of weeks. Hopefully it won’t flare up. A gamble but I think worth it to get it all done at one time. Less risk, less expense, less everything. Our daughter Jenny dealt with her gall stone problem this way for most of a year before having it removed. So continued prayers are still needed for no flare up, quick and easy coordination of surgery, successful uneventful surgery, no metastasis, no need for chemo and quick full recovery. My take on it is that God gave me a bellyache so the cancer would be found early enough to be treated successfully. Praise the Lord. His will be done. I am at peace. Thanks for your prayers. I began an unexpected medical journey on Sunday 9-7-14. I initially thought if I blog about this then my friends can go to one place and keep up to speed. Then I thought that would be a lot of work to keep the blog up to date. Then I thought I’ll put it on Face Book and send a few emails that should do it. So that is what I did. My Face Book entries and emails have generated a fair number of encouraging responses of which I am grateful. I appreciate that folks care about my well being and are taking the time to ‘like’ or comment. Nevertheless as this medical plot thickens and my mind grapples with the issues I keep returning to the blog idea. I have a couple of web sites that don’t get much use or updating so why not? Then I thought If I write about it it will be cathartic. I’m pretty low key and analytical but do find that if I express the bazillion thoughts that go through my little grey cells it helps me come to better decisions. Maybe not better but feeling more comfortable about them since they are processed to a greater degree. I’m very process oriented. Ask my wife. So I guess this is the beginning of my Stomach Ache Blog. Stay tuned. See now I want to go back and reread this and polish and edit it which ends up taking forever. I need to learn how to just write what I feel/think and move on. So I’m going to post this without any edits. Doesn’t mean that I won’t edit it at some point in the future. UGH! Here I sit trying to help a friend get a new web site working. He knows nothing about web sites and I know a little bit more. Just enough to be dangerous. Two weeks later I now have 12 galleries containing over 400 photos with captions and a bit of dialog describing each gallery. I think these galleries give a pretty good picture of the high points of what I’ve been doing for the past couple of years. I still have a lot I’d like to do on the site. It would be nice to have a way to sell some of my stuff, add a links page of my favorite sites, add some downloadable ‘how to’ documents that I have written, figure out how to change some of the formatting, add a logo to the header, separate kratzerkomments.com (blog) from kratzerkraft.com (gallery & sales) etc., etc. In the end this is probably a lot of wasted time if no one looks at it. So now all I have to do is figure out how to get some people to look here. So now I’m off to toot my horn on Face Book and anywhere else I can think of to try to develop and audience. By the way if you don’t want to miss any of my captivating photos and scintillating prose just sign up for the RSS feeds at the bottom of the right hand column. Feel free to add comments by clicking the little cloud at the top of the posts or the ‘leave a reply’ link at the bottom of each post. My frustration with rotated photos now has a solution. A plugin called Image Rotation Fixer has been installed and now my pictures upload as I have them saved. I now have 12 galleries of my work on line. I still need to add captions to many of the photos but my viewers can at least get an idea of the kind of work that I do. I continue to find that I’m not much of a blogger. I guess I have things to say it just seems to take a lot of time to get them written down. I think a whole lot faster than I type. Additionally I have my doubts that many folks will even read my ramblings. I’ve heard that it is best to write about things you know. Since I know most about myself and what I’ve done over the years I will probably try to write a blog or two about some of the more interesting projects I have completed. If I get real ambitious I may even remember to write about something while I’m doing it. Anyway I need to refine my galleries, add captions and maybe even another gallery or two. So enough for this entry. If your are interested check back occasionally. There may be something new. If I get smart enough I may even figure out how to add RSS feed so my wisdom will show up in you inbox if you desire. I also would like to setup a store where you can purchase my creations with PayPal. Time will tell. So long for now. Thanksgiving weekend we are in Huntsville AL eating and loafing with Hannah’s brother and sister-in-law. Have some time to tinker on the web site. I found a free plugin from bestwebsoft.com for creating picture galleries. So far I have created two galleries but have yet to figure out how to rotate images. I have them saved on my hard drive rotated to proper orientation but when I upload them the revert to the not rotated orientation. Gotta be a way. Bah, Humbug! Johnny Bowman on Hello world! Dave Voegtly on Home Again! Dave Voegtly on To Blog or not to blog?